Usually I try not to bring with me new samples for testing on a vacation. The idea is not to influence my first impression one way or the other as well as not to change my usual testing routine. But Regime des Fleurs arrived not long before we were to leave, and it was a Hawaii-themed collection, so I took it as a sign. Look at this official photo for the collection! These bottles bring to mind some exotic drinks taken out of the fridge a minute ago. Obviously, perfumes were just made for a tropical vacation, right?! Wrong! 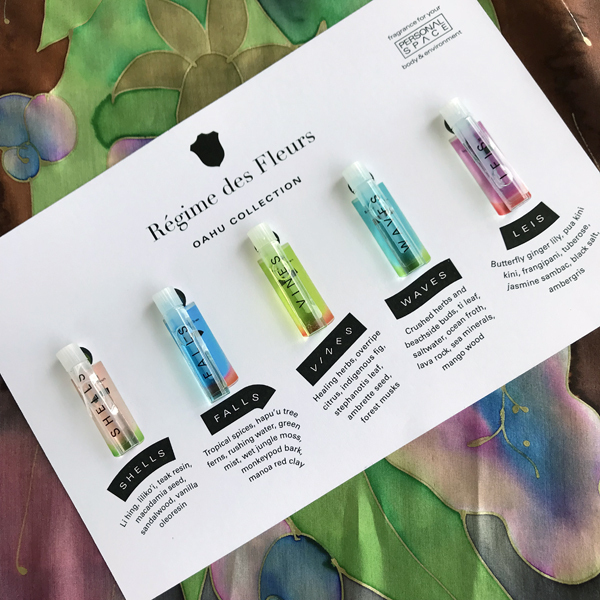 Regime des Fleurs’ Oahu Collection perfumes not only smelled chemically artificial in Big Island’s environment (Wrong island?) but also they had absolutely no tenacity in hot and humid weather. I was so disappointed that I didn’t write down any specific impressions from my testing: I had no intentions even to mention these perfumes on the blog. But then I decided to do a write-up on them for my Second Sunday Samples post, so I had to test them again. Suddenly, in our California warm Fall these perfumes behaved completely differently. 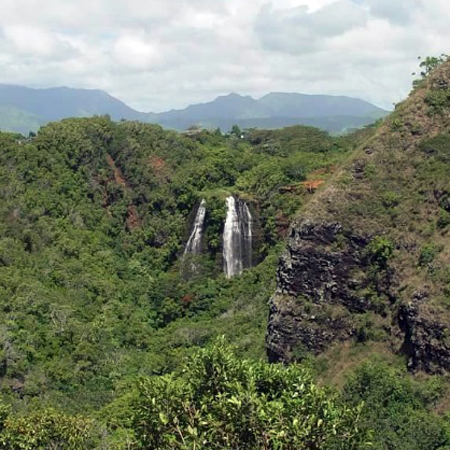 I think that, similar to my experience with Selva Do Brazil by Parfums Berdoues that I mentioned in the previous post, these perfumes project the idea of Hawaii rather than are intended to be used there. I ended up being too busy and missed the intended posting schedule but not to waste the efforts, I transformed my quick impressions into the second episode of my vacation series. Five perfumes in this collection are Shells, Falls, Vines, Waves and Leis. The least favorite out of the five tested were Waves (crushed herbs, beachside buds, ti leaf, saltwater, ocean froth, lava rock, sea minerals, mango wood) and Falls (tropical spices, hapu’u tree ferns, rushing water, green mist, wet jungle moss, monkeypod bark, manoa red clay). Waves, to my nose, in the opening smell as toothpaste. It settles down quickly and becomes just not too interesting: some aromatic herbs and something aquatic. Not a fan. Falls, while not producing any immediate negative associations, just does nothing for me. Testing it I’m pressed to define what I smell and why I dislike it but I do. So, as much as I like both ocean and waterfalls, these two perfumes were a miss. Out of all, Leis (butterfly ginger lily, pua kini kini, frangipani, tuberose, jasmine sambac, black salt, ambergris) had the most theoretically recognizable notes and one unfamiliar but very intriguing – pua kini kini (Perfume Flower Tree). While Leis is a quite pleasant light fruity floral perfume, it doesn’t showcase any of the declared notes (which might be not a bad thing for me when it comes to tuberose) and doesn’t satisfy my curiosity about pua kini kini. 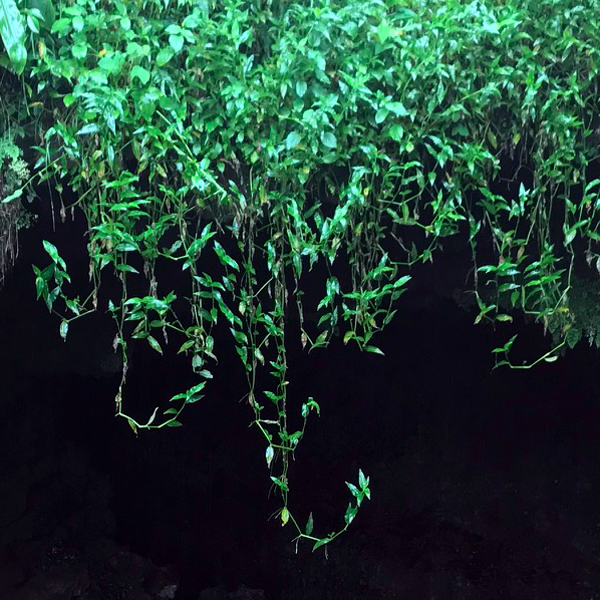 In Vines (healing herbs, overripe citrus, indigenous fig, stephanotis leaf, ambrette seed, forest musks) I don’t recognize fig (indigenous or not), can confirm some herbs (not sure about the “healing” part) and probably musk (“forest”?! ), but beyond that I can’t say much: I’m not familiar with the rest of ingredients and not sure I have any reference points for describing what I smell. But the composition is rather pleasant; I liked it the most and could see myself wearing this perfume once in a while. Shells (Li hing, liliko’i, teak resin, macadamia seed, sandalwood, vanilla oleoresin), probably the most abstract inspiration image for perfume, was the biggest surprise when worn in cooler weather. I was upset though that I couldn’t smell passion fruit (liliko’i), not even because I especially love this note in perfumes (I would have gone with Arielle Shoshana perfume if I did) but because that scent is very distinct and I know it really well, which I can’t say about too many notes. 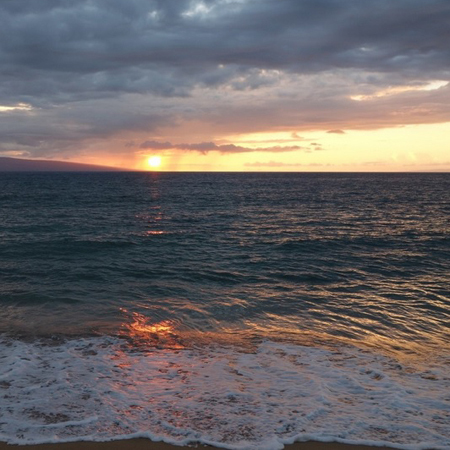 But as an abstract idea of that part of Hawaii ecosystem Shells is pleasant enough to try – if you come across this brand. All-in-all, while I liked two perfumes from the collection, I’m opposed to the idea of perfumes that are designed for both “body and environment.” On more than one occasion I used an ambiance spray as a personal perfume but those were bought as such – room sprays – and were priced accordingly. $125 for a 100 ml bottle of summer cologne is not that outrageous, if you like the scent, but as room spray it seems a little too aspirational. 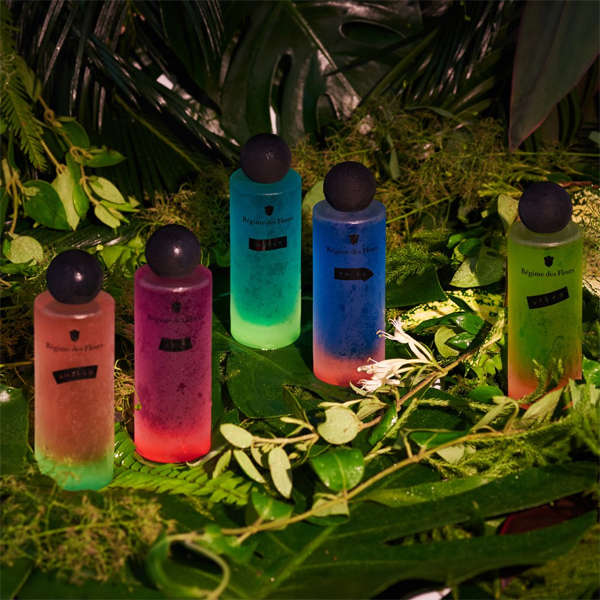 But bottles are attractive, and colored juice looks playful (and reminds me the new Mugler Cologne collection), so I do not feel completely dismissive towards Oahu Collection. As for samples, I got them free of charge (not as a blogger: the brand had offered them to NST’s readers in the comment to the announcement of this line release), so I shouldn’t look that horse in the mouth. But as a blogger I still want to comment that, in my opinion, both for the price they charge for the “Sampling Flight” ($25, credited towards a full bottle purchase) and to make justice to their perfumes, they should look into switching to spray format (even if with the same 1 ml volume): dabbed, these perfumes do not either project much or live long.